In an alternate 1983, a lumberjack hunts down the cult members who abducted his wife. Few movies are associated with the excess of the 1980s quite like Rambo: First Blood Part II. That movie was directed by George P. Cosmatos, whose son Panos (who funded his first movie, 2010's Beyond the Black Rainbow, with his father's royalties from directing the 1993 western Tombstone) has penned a love letter in psychedelic ink to the darker side of that decade's pop culture with his sophomore film, Mandy. Panos' film channels the '80s of heavy metal album sleeves, of Dungeons & Dragons, of choose your own adventure paperbacks, and of course of the era's exploitation cinema. It's the sort of movie we '80s kids dreamt of when we gazed at the outrageous and usually misleading artwork that adorned VHS sleeves. That's to say there isn't much in the way of plot, but Panos creates some images that will be burned into your brain for a while after viewing. The melancholy drone of Robert Fripp's guitar on King Crimson's prog rock anthem 'Starless' sets the mood for the curious film to come as the credits play out over a montage of Nicolas Cage's Red (named presumably after the 1974 King Crimson album) finishing up a day's work at a mass lumberyard and returning home to his younger wife Mandy (Andrea Riseborough) in their secluded woodland home. For much of the film's first half we're simply hanging out with Red and Mandy, but even before the movie's villains make an appearance we get a disquieting and foreboding sense of unease. Mandy's face bears a scar, which is never directly referred to, but a disturbing anecdote about her childhood gives us some clues to its origin. We get the sense that Red offers Mandy protection from some evil she knows will come for her some day. That evil arrives in the form of a cult led by Jeremiah Sand (a delightfully sleazy Linus Roache). Like Hitler and Manson before him, Sand is a failed artist striking out at a world that refused to appreciate his talents, in this case his self-titled psychedelic folk album. Sand spots Mandy on the road one day and asks his lackeys to bring her to him. It's from here that the film gets so whacko that what unfolds might be read as no more than a dream playing out in the mind of the title character, inspired by the fantasy books she reads and the heavy metal she listens to. Suffice to say Red finds himself forging a giant axe and battling against cult members and demonic bikers that wouldn't be out of place in a Hellraiser movie. Oh, and a tiger on LSD shows up at one point. You're either on board with this sort of thing or you're not. Personally, I'm this movie's target audience, which is perhaps why I felt a little too pandered to at times by Cosmatos' film. Once the revenge narrative kicks in, things get a little too referential, with Cosmatos giving us images that are clear nods to the likes of Friday the 13th (we're told Red and Mandy live just down the road from Crystal Lake), The Evil Dead (the more bloodied and crazed Cage becomes, the more he resembles Bruce Campbell; and wouldn't you know it, a chainsaw is brandished at one point) and Twin Peaks (Doctor Jakoby's Hawaiian backdrop makes a bizarre appearance). You begin to feel Cosmatos is more interested in telling us what his favourite movies are than in making something interesting of what boils down to a rather generic genre setup, as he fails to construct any distinctive set-pieces, and there's something emotionally distant about watching Red's rampage of revenge play out, even if it is beautifully shot. Far more successful is the movie's first half, particularly anything involving the eponymous Mandy. With her expressive, sad eyes, Riseborough does a great job of filling in some of her character's blanks - hers is a haunting performance. Cosmatos' early world building is exemplary, creating a setting that looks like America but not quite, much like the otherworldly landscapes of Andrei Tarkovsky's sci-fi work, and it's a pleasure to spend time in. While it's perhaps a bit too artistic and self-conscious to compete with the best examples of the sort of down and dirty genre cinema Cosmatos is aping, Mandy offers patient viewers two hours of darkly sensual delights, not the least of which is the late Jóhann Jóhannsson's ominous score. It's an experience as akin to soaking in a bath as to watching a movie, but with its extreme violence and dark world view, you may feel like taking a shower afterwards. 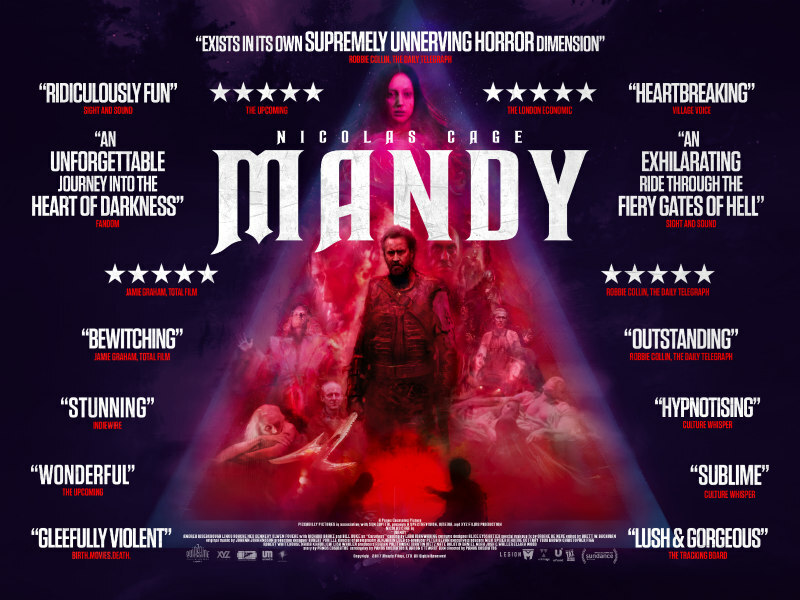 Mandy is in UK/ROI cinemas October 12th.